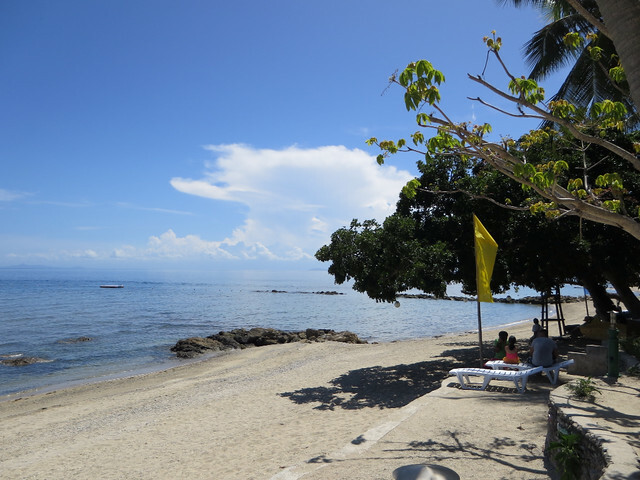 Palm Beach Resort in Laiya, Batangas. 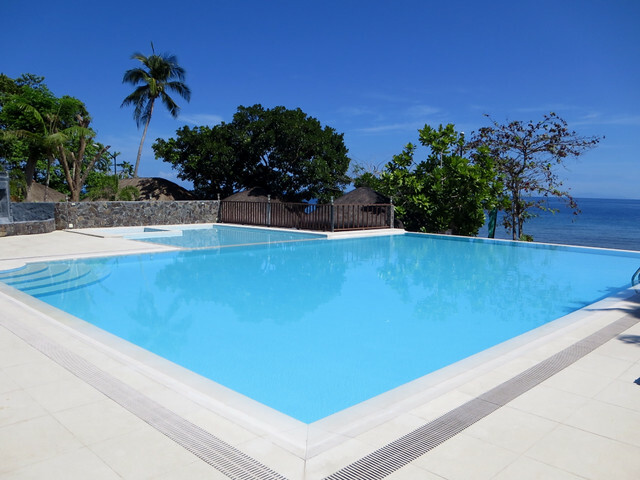 If you're thinking where you can go this Holy Week, I suggest Palm Beach Resort (formerly La Frondosa) in Laiya, Batangas. This is where T and I stayed when we attended theMind Body Soul's finance & yoga retreat a few weekends ago. It's only a few hours drive from Manila so less moolah and preparation are needed. 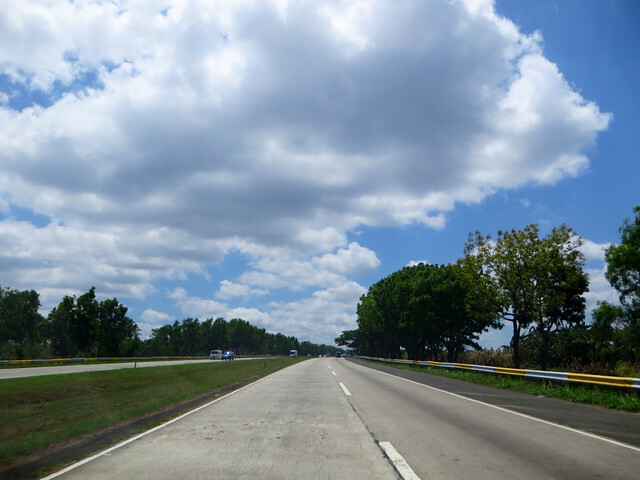 - Take South Super Highway heading south and connect to the new STAR TOLL in Calamba. - Exit at IBAAN, which is the next exit after LIPA. - Upon reaching the Exit Toll booth, turn left and cross under the STAR TOLLWAY. - Follow this road and watch out for the sign “Alternate Route” and turn LEFT immediately. - Drive on and when you hit the main provincial road, turn RIGHT (Petron is just across the street). 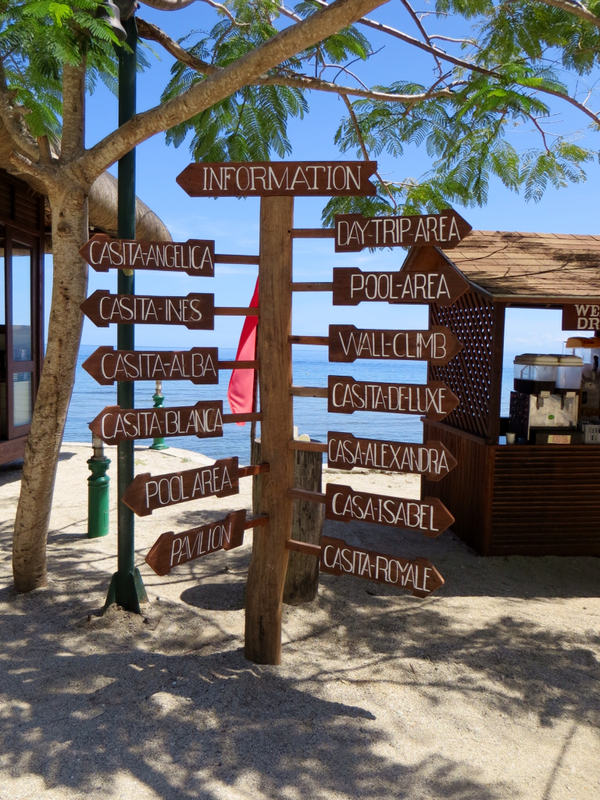 - Pass the town of ROSARIO and proceed towards SAN JUAN. - After a few kilometers, you will see a sign of the Batangas Racing Circuit (do NOT enter this road). - Veer LEFT at this junction and this will take you all the way to San Juan. 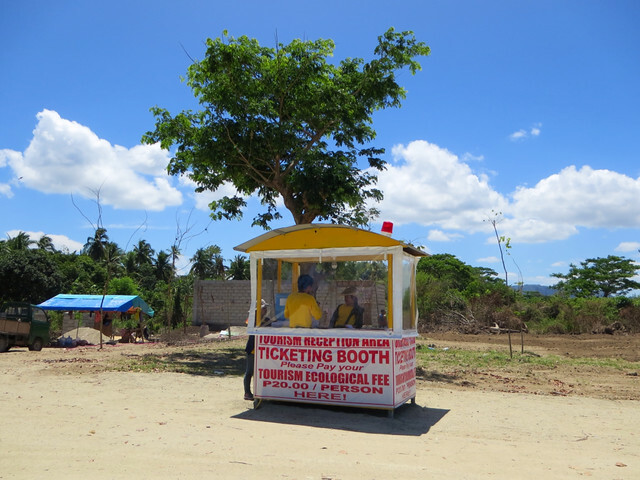 - In the town of San Juan, you will pass a Petron Gas Station and Dunkin Donut. Proceed further, and TURN RIGHT immediately after the Municipal Hall. This road will take you to the Barrios of Laiya and Hugom. The distance from Municipal Hall to the Resorts is approximately 20 – 24 kms. 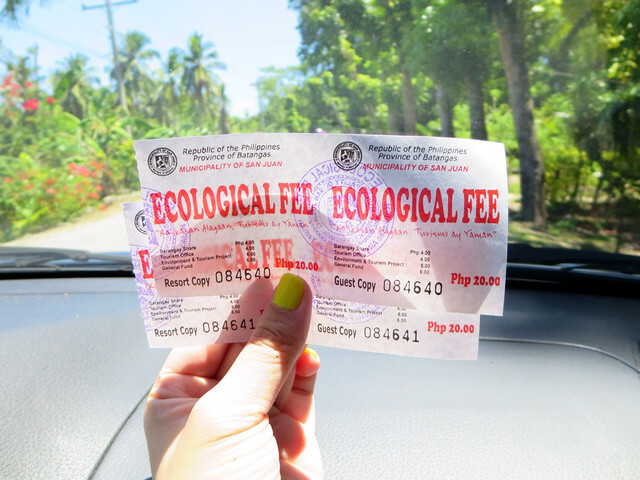 When you reach Laiya, don't forget to pay the P20 per person Tourism Ecological Fee. You can't avoid this because: 1) there are men who will stop your car and ask you where you are headed; 2) the tickets have a resort copy which you have to surrender at your destination; and 3) you have a conscience who will tell you that this is a small price to pay to help save the environment. 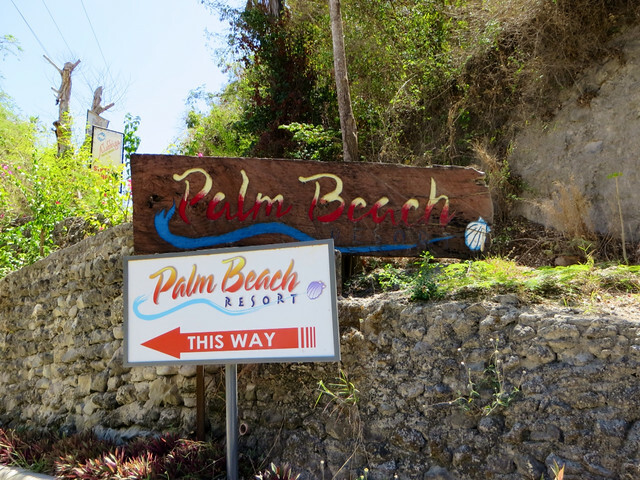 You will pass almost all known Laiya beach resorts like La Luz and Virgin Beach Resort before reaching Palm Beach Resort, which is situated on top of a hill. The parking area is on the hill as well so it's a long walk down. 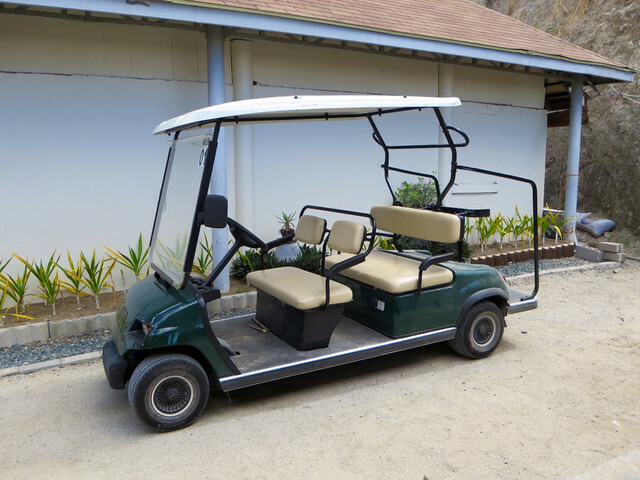 But when we got there, a golf cart was already waiting to pick me and T up. As soon as the golf cart stopped, a lady with a radio came to greet us. I love how coordinated and organized the staff of Palm Beach Resort is! Before we knew it, our luggage was already being carried by two men while another lady led us to our room. T and I stayed in a Suite at the Casitas Deluxe which has two double beds and a daybed. T and I didn't expect it to be this nice. It had airconditioning but I love how it also has a ceiling fan for those times when we just want to open the windows and feel the warm sea breeze. 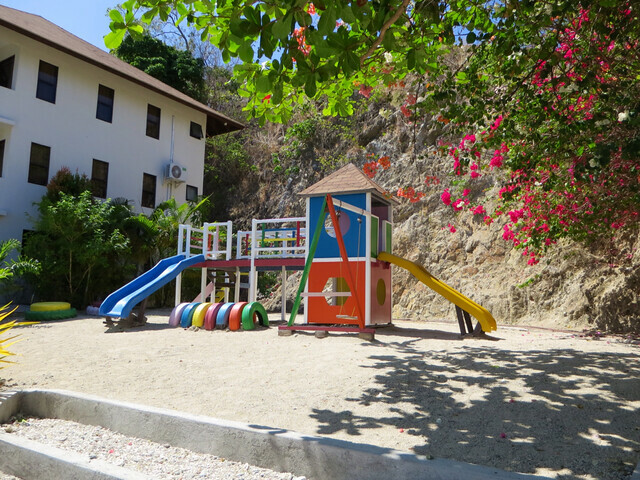 There are also whole casas for rent like Casa Isabel where Garet and her friends stayed, which has a terrace on the ground floor, decks on the second and third floor, as well as 5 bedrooms. The casas are good for 20 persons. The day bed is located beside the TV, facing the two double beds. 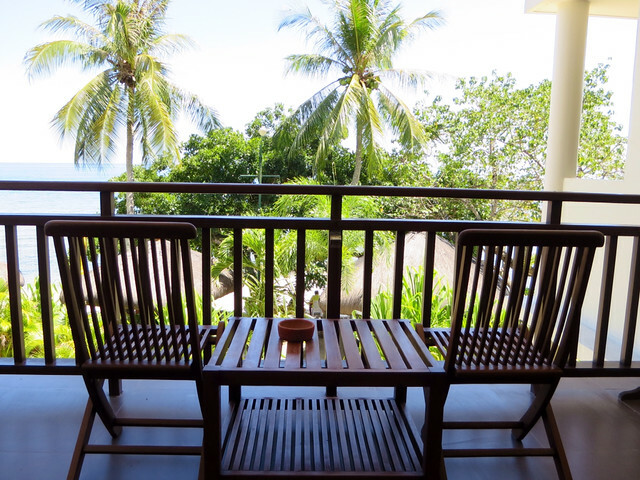 My favorite part of every beachfront room is the veranda so I was happy that ours had one. 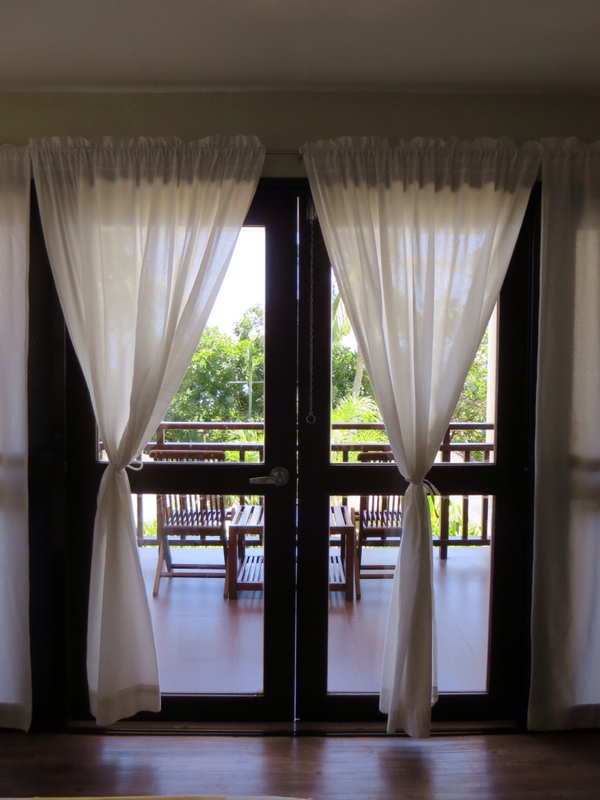 For me, verandas are the perfect place to read or write. I've finished a couple of books and blog entries while hanging out in verandas during vacations, my favorites being the ones in Bellarocca and Dos Palmas. The bathroom is divided into three areas: the toilet (left), the sink (middle), and the shower (right). 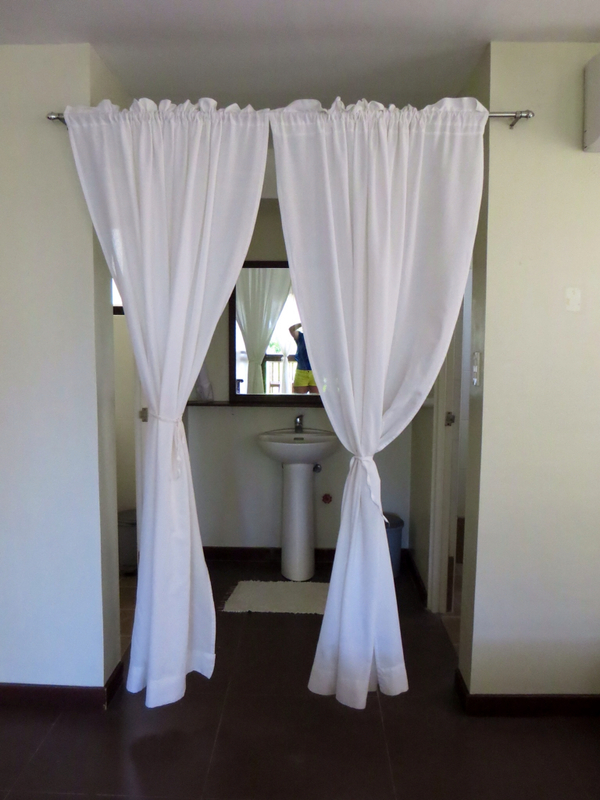 The toilet and the showers have doors but the sink just has these curtains. I think this is a nice touch. 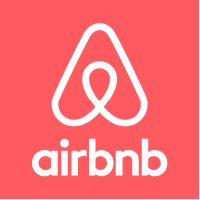 Also, if there are four of you staying in a room, waiting time to use the bathroom isn't that long since three people can use it at the same time. It was already noon so T and I went to the Dining Pavilion to see what's for lunch. Food is spread out buffet style so people can just get what they want. The drinks are bottomless. 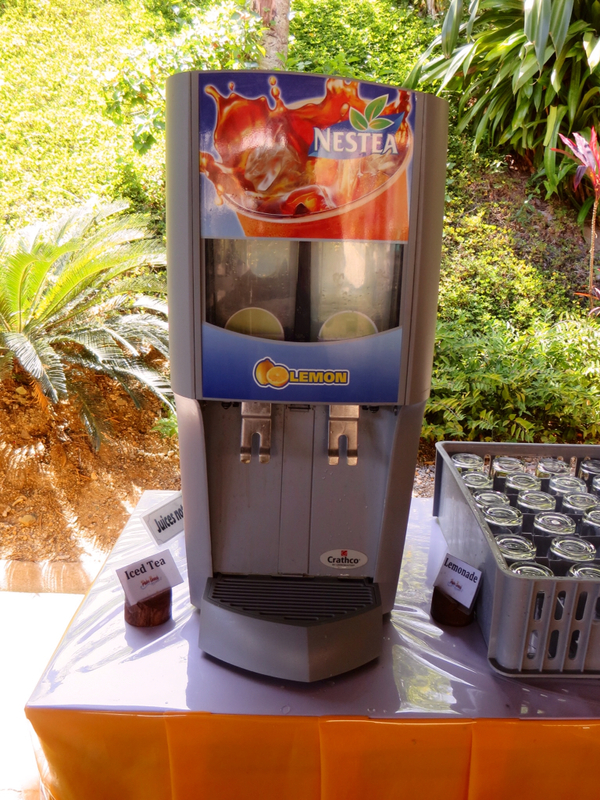 There's iced tea and lemon juice. There's also tea and brewed coffee. Yes, brewed. Hurray for me! I noticed that they serve muscovado instead of white sugar. Good for the health conscious. After eating, T and I walked around to shake the food off. The infinity pool is quite nice. If we didn't have a schedule to catch, I would have wanted to take a dip. 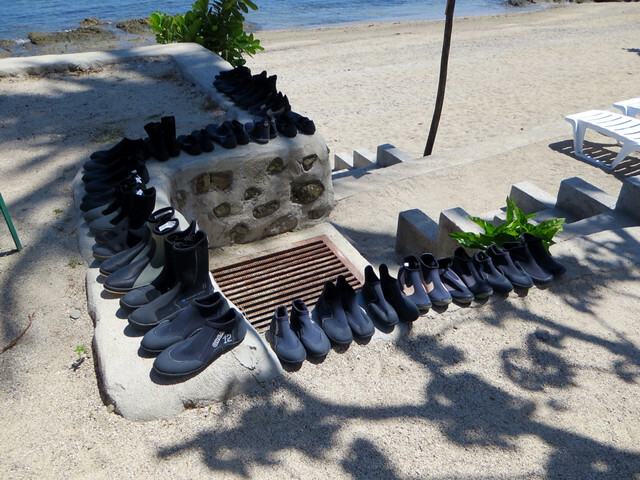 The beach area is quite rocky but the resort offers aqua shoes to overnight guests for free. 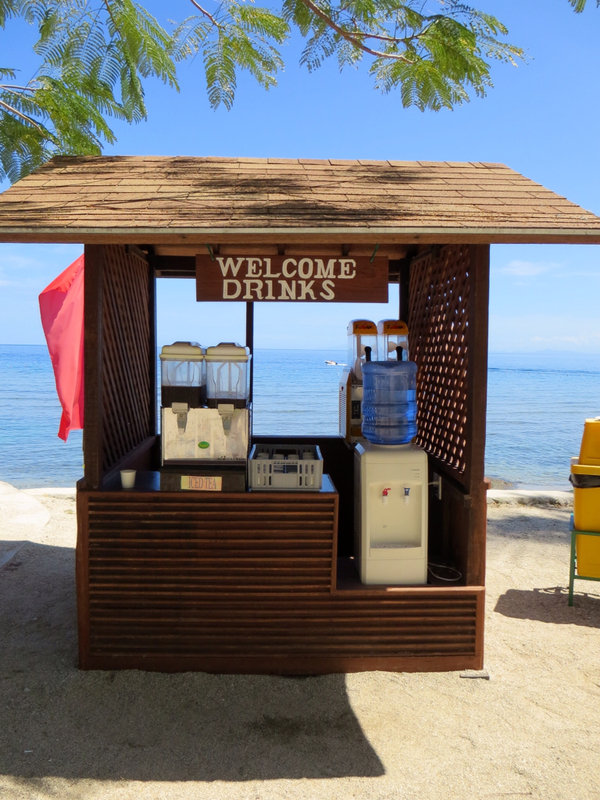 There are also nice cabanas along the beach reserved for overnight guests. To those who have kids, there's a playground nearby. Snacks are also included in the package given to us but we weren't able to avail of it since T had a massage in the room (P300/hour) while I was at the seminar and we were given juices and cookies for snacks. 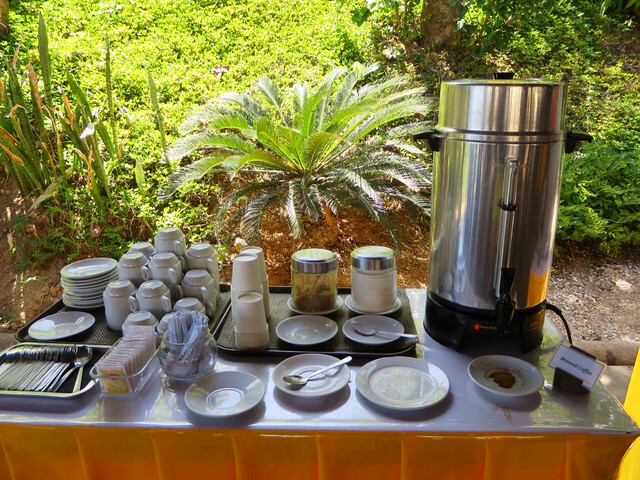 But according to the people who went to check out what was served, there was yummy local delicacies and hot chocolate. 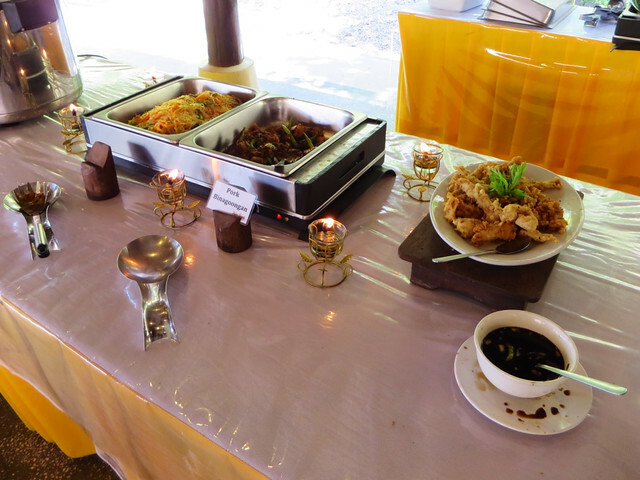 I wasn't able to take a photo of the dinner buffet because I was so hungry from our sunset yoga session, but food was ok. There was something for everybody: for the healthy eaters, there was salad and roasted chicken; for the not-so-healthy eaters (present! 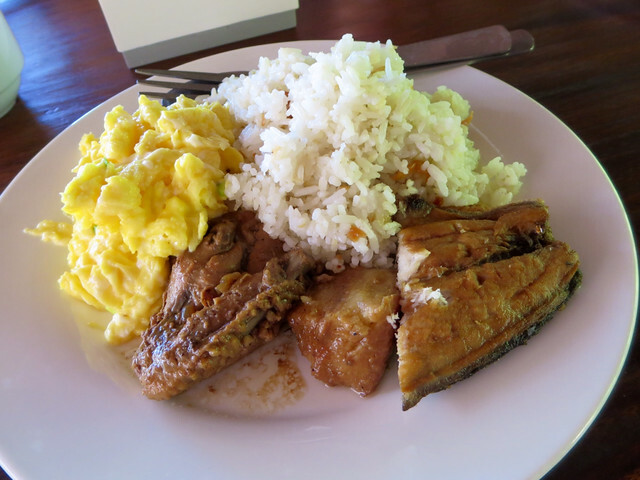 ), there was rice and liempo. Dessert consists of fruits and palitaw (rice cakes with coconut and sugar). The next day, my body was aching so I woke up late. 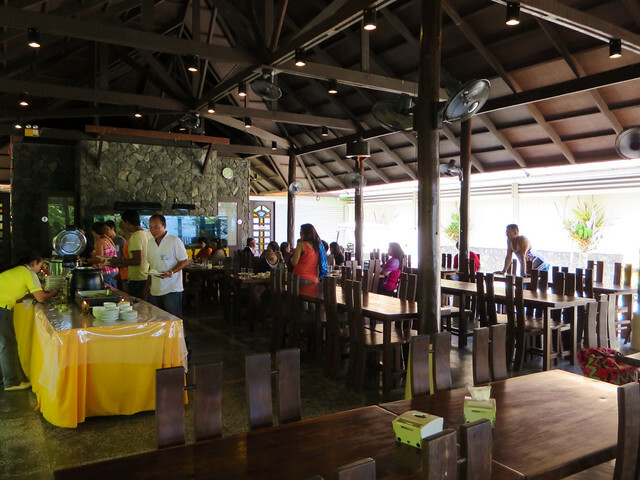 When T and I got to the dining pavilion at around 10, the breakfast buffet was already closed. But the girl who was clearing up was nice enough to ask us if we were ok with a plated breakfast. Then she gave us a very generous serving each. That was really nice of her! 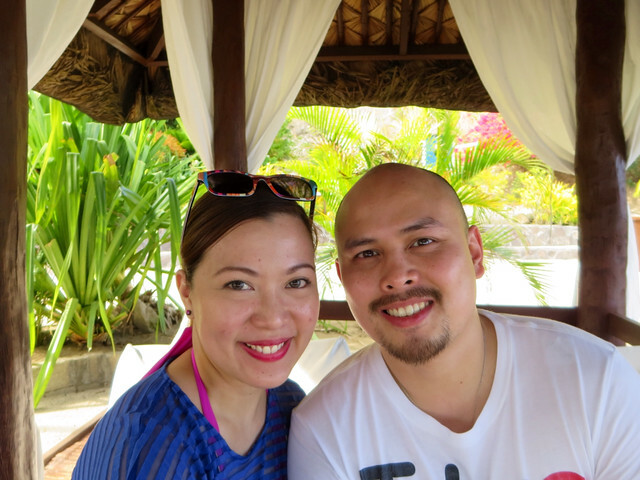 T and I really enjoyed our stay at Palm Beach Resort. If we only had an extra day, we would have stayed longer. 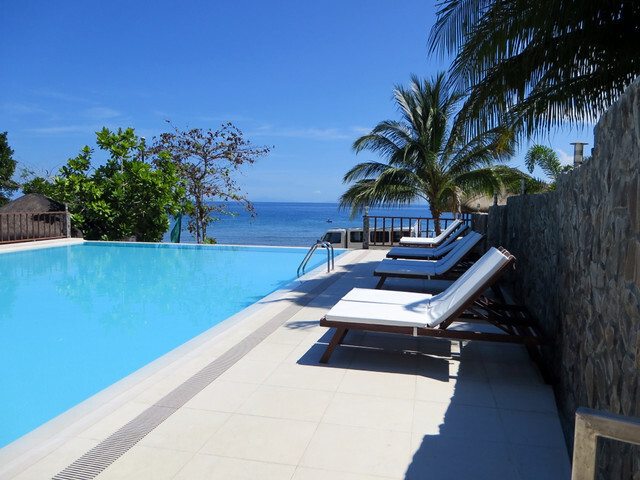 At least now we know where to stay if ever we want to go back to Laiya again. Organized and coordinated welcoming committee. Very nice and accommodating staff. 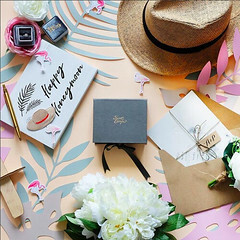 Nice package for big groups since you can have a casa all to yourselves. Beach is a bit rocky but I'll give plus points to the resort for providing aqua shoes for free. 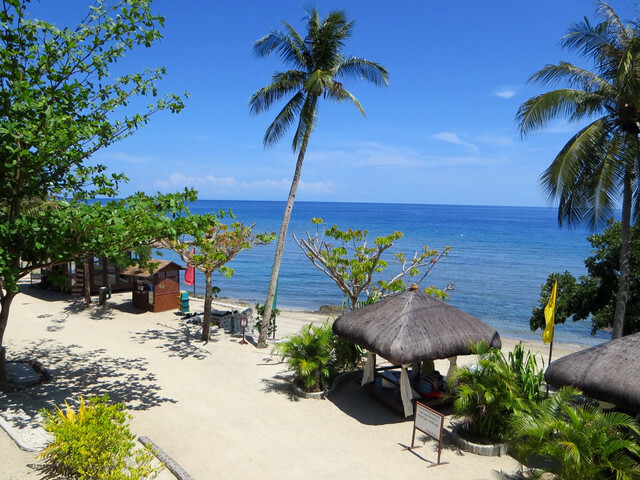 Palm Beach Resort is in our list of top places to stay in Laiya. 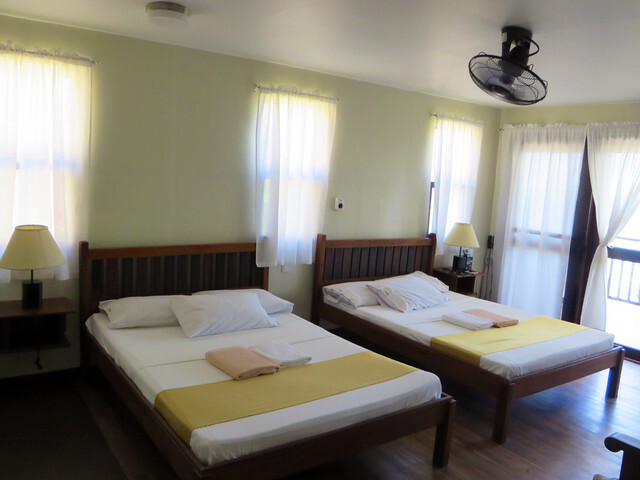 We stayed there for 1 night but it was part of the package of this yoga retreat we attended. 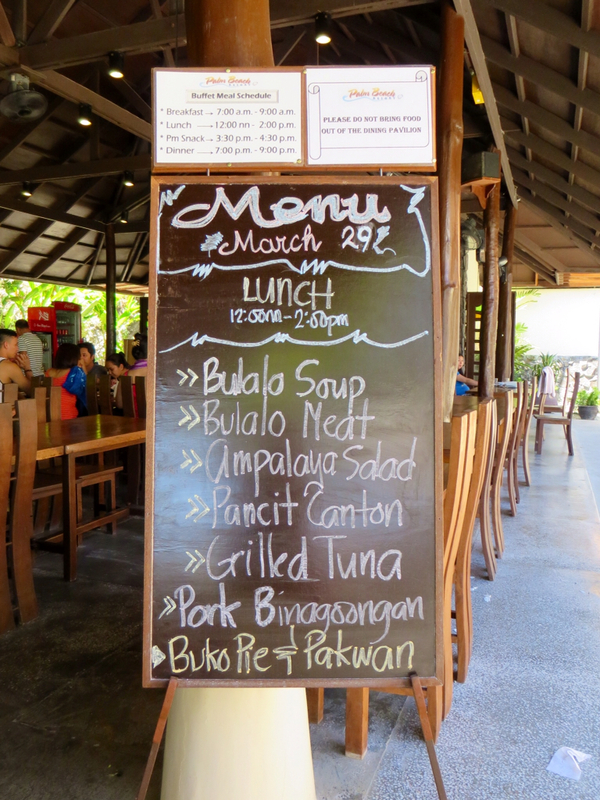 Full board meals (lunch, merienda, dinner, and breakfast) were already included in our stay. Hope this helps! Hi Jill! 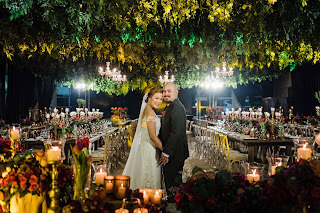 We went there during the summer and I haven't been back since so I can't answer your question about how the resort is during August :) But as you can see in my photos, the food is surrounded by candles, probably to keep the flies away. Hello. It might be better to reserve so you can be sure that you'll get a room. They might be full. At the start of my post, you can check availability and book the room you want there as well. As for public transport, I have no idea. 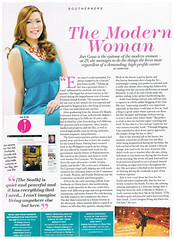 Mind Body Soul's The Beach Body Project. 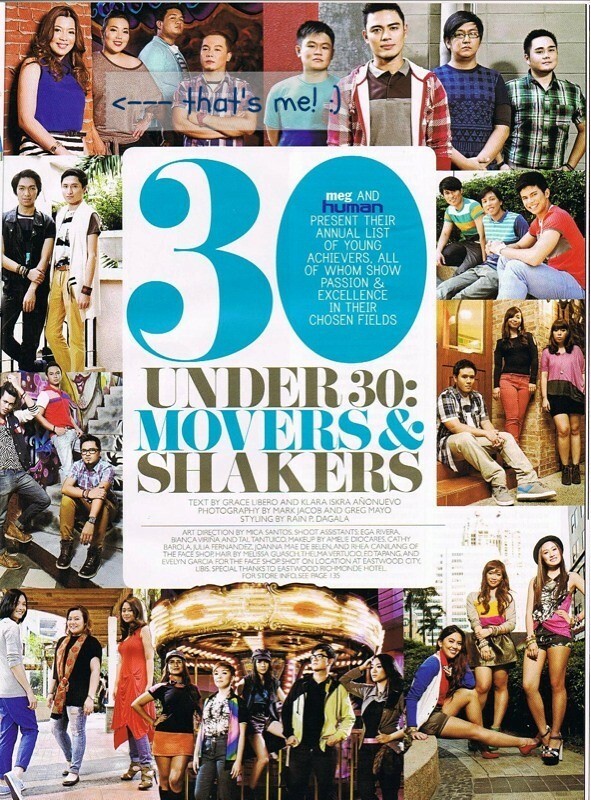 Vivere Hotel Alabang (part 3): The Nest. Miraculous Infant Jesus dela Providencia. Just Thai in Molito Alabang.